I believe hoards to be biographical and this is my attraction to the practice. As I walked around the homes of the participants and spoke to them, I could identify traces of their narratives in what they chose to collect. 'Someday soon' was a common sentiment shared by the participants. Each insisted that one day they would use the items they had accumulated. This was best exemplified by Heidi Redelinghuis who collects more than 19 magazines each month. She insisted that someday soon she would go through all her magazines, cut out and archive all the articles that interested her and discard the remains. This is a claim she has made for years but one which she is still to fulfill. Someday Soon entailed convincing participants to entrust their hoards to me for the duration of an exhibition of their possessions. Someday Today is a progression of this process. In Someday Today, Mokgotho provides the opportunity for Redelinghuis to act on her pledge. The side gallery will be transformed into a work space where she will read through her collection of magazines, retrieve whatever is of interest to her and archive the cut-outs. 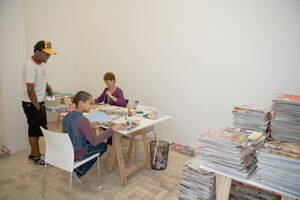 Over three days, Redelinghuis and Mokgotho will reside in the space, creating an archive of her magazine articles. The archive will be made available to visitors to the gallery for viewing as it materialises. Visitors will also be invited to participate in the creation of the archive and to offer suggestions. My hope is to create an environment in which connections between people can be made, whether those connections are between Heidi and myself, between visitors/participants and the two of us, or between participants themselves. Mokgotho was born in 1986 and graduated with a BAFA (Hons) from the University of the Witwatersrand in 2009. He lives in Johannesburg. The exhibition opens on Thursday 22 April, 6-8pm. Mokgotho and Redelinghuis will be in residence from 10am to 5pm on Thursday and Friday 22/23 April, and on Saturday 24 April from 10am to 1pm.